When baking one of my favorite cookies, I was able to use all organic ingredients, except for the baking powder and the decorations. I did search the internet for organic colored sugar, but could only find “natural” sugar. I was able to find organic food coloring, but it was $9.99 for 1 ounce and the manufacturer could not guarantee the flavor, if subjected to heat. I would then have to make my own sugar. Fortunately, no one in my family has any known sensitivity to food dyes. With that being said, I decided to use what I already had in my pantry, since I rarely bake and decorate cookies. 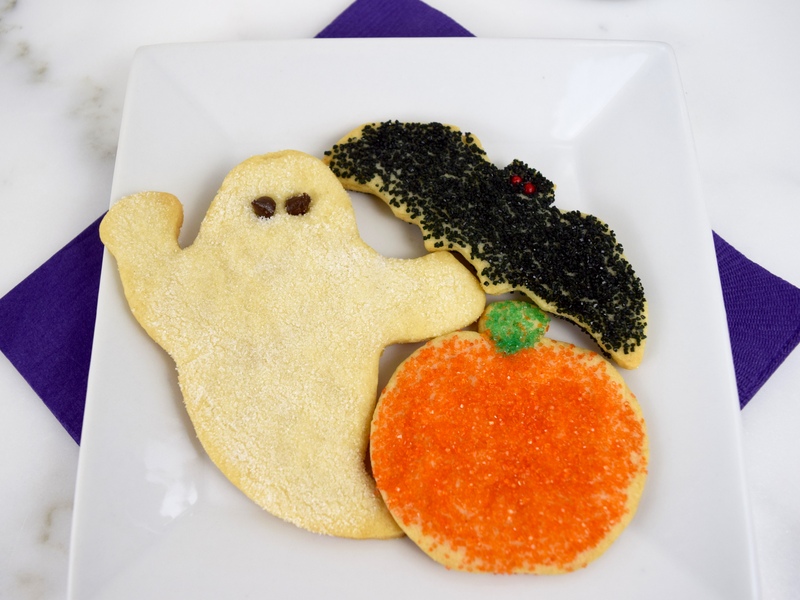 For those who prefer not to use colored sugar, the cookies are still quite festive using Halloween cookie cutters and plain sugar! The sugar cookie recipe that I am sharing with you is one that my mother used when baking cookies for my sister and me. In fact, my mom made them using margarine, OMG! These delicious cookies are tender and with a delicate buttery taste and hold their shape well for decorating, whether you decorate using sugar or royal icing. In a large bowl, thoroughly cream together butter, sugar and vanilla. Add egg and beat until mixture is light and fluffy. Sift together flour, baking powder and salt. Stir into cream mixture, blending well. Divide dough in half. Cover. Chill 1 hour. On a lightly floured surface, roll dough until it is ¼-inch thick. Cut into desired shape using a cookie cutter. Decorate with sugar. Place on parchment lined baking sheet. Bake for about 10 minutes, until slightly golden brown. Makes about 2½ dozens cookies. The pictures below were taken twenty years ago, when my daughter, Laura, was five-months-old. They were taken on a beautiful fall day in the suburbs of Denver, Colorado. I was quite crafty back then, because I made her costume. 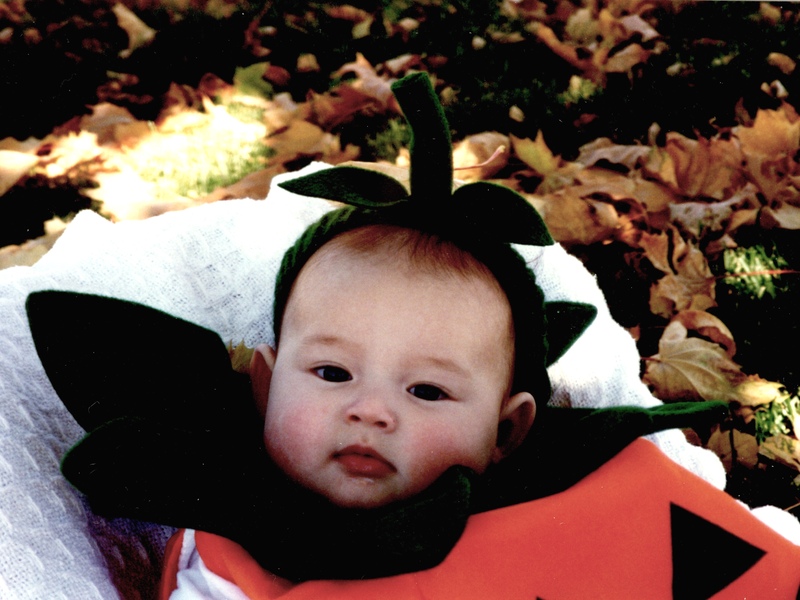 I was quite practical too, because she wore it the next year as a walking pumpkin! These pictures bring back fond memories of our little girl and our days in Colorado! 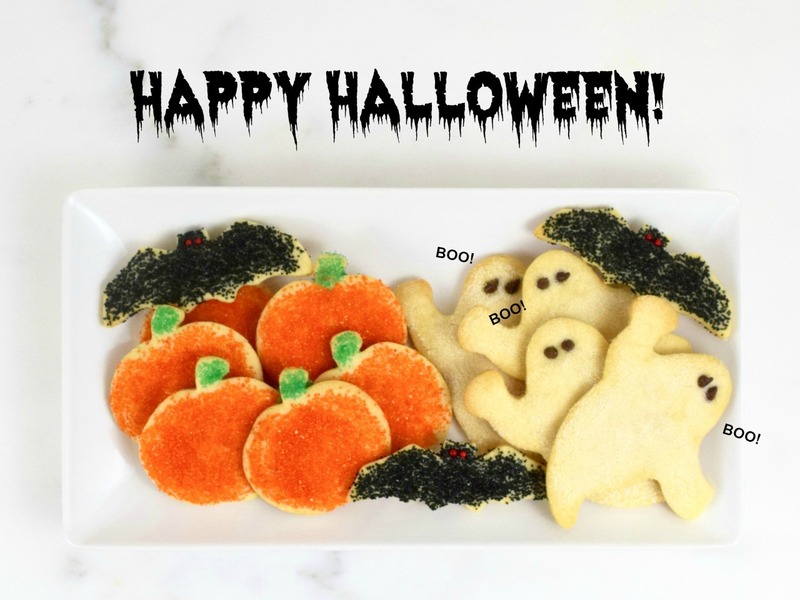 For those of you, who participate in the holiday, wishing you a happy and safe Halloween! Lili, thank you! I am enjoying all the wonderful things you bake! Oh my what a wonderful post!! I love the adorable cookies and the memory pictures! So lovely! Where does the time fly?? Thank you so much, Lynz. Your cookies look great. saved the recipe. I need to make some cookies for Halloween. 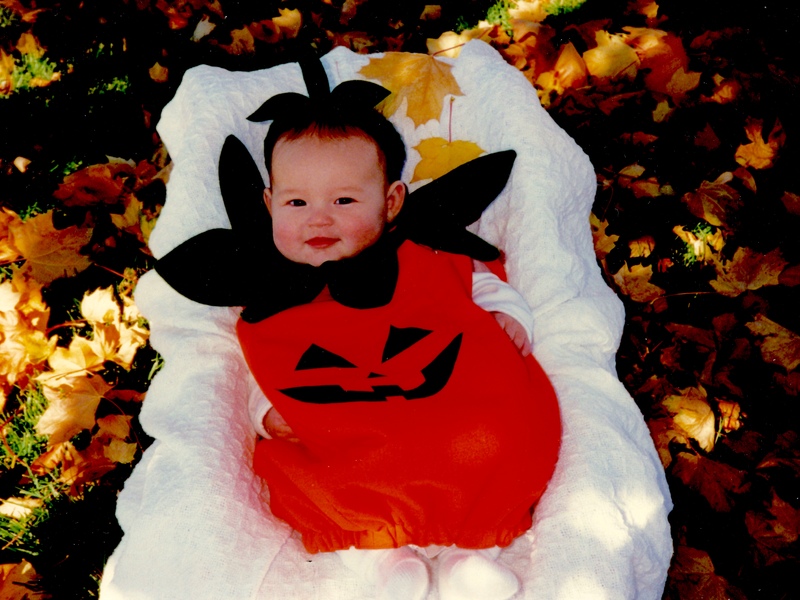 Your little girl is adorable and love that pumpkin costume. Thank you, Suzanne. Happy Halloween! These cookies and the babe look adorable! I love Halloween. It’s just fun. I love the pictures of your daughter! So cute!! And, these sugar cookies look delectable. I’ve been very into making different Halloween treats this year.. I’m so excited to enjoy more at the fiesta. Happy FF, and I hope you have a wonderful weekend! You nailed the cookies so well. Your daughter looks sooo adorable. I am sure she has grown up to be a pretty lady. God bless!! There’s nothing like a good sugar cookie recipe. Made right – they are just the best and I know from your description of them that they’d be just perfect. But I really love the photos of your little pumpkin. I have a daughter Laura too. And you brought back memories. I made her a lion costume from an old faux fur for her first Hallowe’en costume. She wore it for a couple of years and the photographs of her in it are just so adorable. Lindy, thank you so much for your lovely comment. It’s nice to know that we have something else in common besides food!